brandy; ignite over meat. 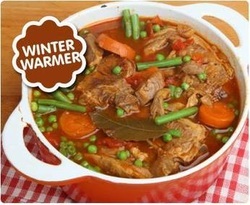 Place meat in casserole. stirring constantly, until mixture thickens. Cook 5 min. meat and vegetables are tender. A marvellously savoury mixture of meat, cheese and pasta that will have your family licking their lips in anticipation as you carry the dish to the table. The recipe of Mrs. Yvonne Thomas of Bellville, serves 6. Preheat oven to 180ºC. Grease a large casserole dish which has a lid (soos braaibak) or spray it with Spray & Cook. Season the chops with salt & pepper and roll them in cake flour to coat them completely. Place them in the casserole dish. 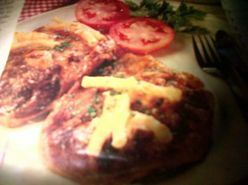 Combine the water, tomato sauce, Worcester sauce & vinegar and pour the mixture over the chops. Sprinkle with the sugar. Bake the chops 60 – 90 minutes, covered. Boil the macaroni and onion in salted water until the macaroni is tender. Drain and keep warm. Spoon the macaroni over the cooked chops and sprinkle with cheese. Return the casserole dish to the oven and bake uncovered, until the macaroni starts to brown. Roughly chop the lamb, add it to a large mixing bowl and coat with the yoghurt, half the spices and half the chilli. Heat the olive oil in a pot and fry the garlic with the remaining spices and chilli, ginger and black pepper, allowing them to blend with the oil. Add the lamb in batches so that the pot isn't too full. Stir and bring to a simmer. Add the tomatoes, chutney and lemon juice and simmer gently for about 1 hour, the longer the better. You will know you're close when the colour starts to change to a rich, Yellow colour and the meat is tender. Wash the mutton pieces, drain and set aside. Boil the potatoes in a little water, with salt to taste, till half-cooked and still firm. Infuse the saffron in the boiling water and set aside. Pan-fry 1 chopped onion in 15 ml (1 Tbsp) of the butter and set aside. Place the mutton pieces in a large mixing bowl and add the buttermilk, green chilli, garlic and ginger paste, dhania, salt, red leaf masala, ground jeera, chilli powder, and turmeric. Mix thoroughly, ensuring that all of the mutton pieces are covered in the marinade. Set aside for 1 hour. Rinse the rice in a colander, drain and place in a large pot on medium to high heat. Add water to reach halfway and add 45 ml (3 Tbsp) salt. Boil till half-cooked (the rice grains should be firm). Transfer to a colander and rinse under cold running water. Drain and set aside. To a large pot on medium to high heat, add the oil and heat. Add the remaining chopped onions along with the jeera seeds, mustard seeds, bay leaves, cardamom seeds and cinnamon and braise till golden in colour. Add the marinated mutton pieces along with the marinade, the 60ml (1/4 cup) of water and simmer on medium heat for about 30 minutes, or till the meat is tender and cooked. Arrange the potatoes between the mutton pieces and spoon the rice directly on top. Pour the fried onion with the melted butter over the rice, and lastly pour the cup of water containing saffron over the rice and onions. Steam, covered, for 35 minutes. Remove the heat and serve dhai and tomato & onion salad. Add the garlic, curry powder, Turmeric and Steak and Chops Spice fry for another minute. Remove from the heat and let the marinade cool down to room temperature. Add the torn bay leaves to the marinade and pour over the meat. Toss to coat and then, cover and marinate for 24 hours. Braai for about 8–10 minutes on hot coals. Baste during cooking. Left over marinade can be thickened by boiling for 5 -10 minutes until reduced and served as extra basting before serving. Heat the oil and brown the lamb on all sides in batches. Remove from the pot. Add all the spices to the pot and return the lamb to the pot moving around to cover all the lamb pieces with the spice mixture. Add the tinned tomatoes, turmeric and 250ml water. Season with salt and pepper and simmer for 90 minutes. Serve with rice, garnished with fresh coriander leaves. Tender, falling-off-the-bone lamb shanks for 4 in only 30 minutes! Lamb shanks make for a perfect dinner to warm and fill you and your family's stomachs after a long day of work and school. Braised in a pressure cooker, lamb shanks become even more savoury – tender, falling-off-the-bone meat and tasty, healthy juices that can be used as a sauce. With your handy, all-around pressure cooker, you can whip this dish up in as little as 30 minutes, including preparation time, and immediately have it hot and ready for everyone to dig into! Pour the flour into a shallow container. Add a dash of salt and pepper and mix. Coat the lamb shanks in the flour mixture. Heat the olive oil in the pressure cooker over medium to high heat. Brown the lamb shanks in the hot oil and the remove to a plate. In the same oil, saute the chopped onion, crushed garlic, oregano and carrots for 4-5 minutes, until onion slices are translucent. Add the tomato paste, quartered tomato, red wine, water and bouillon cube. Stir and bring to a boil then add the lamb shanks back in. Cover and lock lid on pressure cooker. Bring to pressure. When pressure is reached, turn heat down to low. Continue cooking for 20-25 minutes. Remove lamb shanks from pressure cooker and transfer to serving dish. *For a thicker gravy, mix 2 tablespoons of plain flour with 1 ½ tablespoons of water to form a paste. After removing the lamb shanks, stir this paste into the remaining sauce. We recommend some fluffy mashed potato as a side dish. Enjoy! You need a deep pot and if you want to cook this in the oven, use a cast-iron pot. Heat the pot on the stove top and brown the meat in batches or brown the whole shanks if you have decided to keep them whole. ( Notice: no oil) The meat will stick slightly to the bottom, but do not worry, this will give flavor to the final dish. Just make sure you do not burn the meat. Remove the meat from the pot and add the oil. Saute the onions and green pepper and after a few minutes also add the garlic. When the onions and green peppers have browned slightly, add the meat and cook for 15 seconds. Add the soy sauce which will help to release the caramelized bits on the bottom of the pot. Add the tomatoes and place the lid on the pot. Place the pot in the oven or if you are doing it on the stove top, reduce the heat to its lowest setting and let the stew simmer for 1½ hours. Add water regularly so that it does not burn. When the meat is soft, add salt and pepper to taste as well as the oregano and allow to cook through once more. The stew is better if left to stand for a bit. Serve on a bed of Basmati rice or cauliflower mash! lamb in a large bowl and toss together with half of the spice mix. Cover and leave overnight in the fridge. 2.Preheat the oven to 150C/300F/Gas2. 3.Heat 1 tbsp olive oil and 1 tbsp of argan oil in a large casserole dish. Add the grated onion and the remaining spice mix and cook over a gentle heat for 10 minutes so that the onions are soft but not coloured. Add the crushed garlic for the final 3 minutes. De-glaze the frying pan with ¼ pint of tomato juice and add these juices to the pan. honey to the casserole dish. Bring to the boil, cover with a fitted lid, place in the oven and cook for 2-2½ hours or until the meat is meltingly tender. 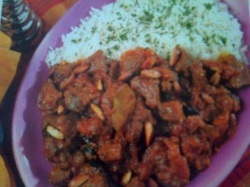 6.Place the lamb in a tagine or large serving dish and sprinkle over the chopped herbs. Serve.